Headline: WIFEFIRSTNAME AND HUSBANDFIRSTNAME CELEBRATE THEIR ANNIVERSARY IN STYLE! The red carpet is rolled out and waiting, and the champagne on ice in TOWNCITY tonight to celebrate COUPLESFULLNAMES anniversary bash of the year. Ryan Tubridy will host the party as the happy couple spend the evening with their many friends and families. RTÉ will broadcast the event live, but Miriam O’Callaghan interviewed the dashing duo earlier. All private helicopter companies have been fully booked up for weeks in order to jet in the elite of the world to TOWN. Bono is believed to have cancelled U2’s American leg of his tour to attend tonight. Other special guests will include Johnny Depp, Kylie, William and Kate and all the members of The Rolling Stones. 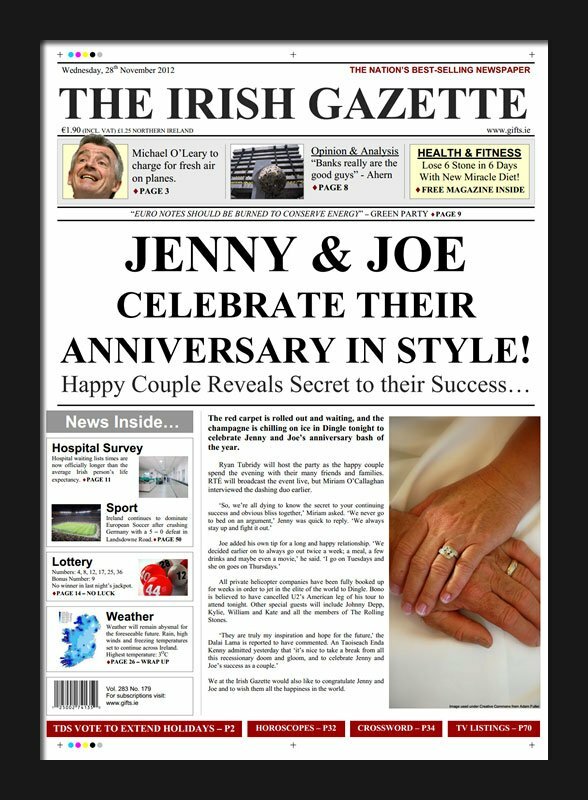 We at the Irish Gazette would also like to congratulate WIFEFIRSTNAME and HUSBANDFIRSTNAME and to wish them all the happiness in the world.